Artificial grass is often used as a play surface – the grass is soft to touch and is a clean, hygienic and low maintenance alternative to traditional grass. When used for play surfaces, a soft rubber base is installed beneath the grass – we call this a shock pad. The depth of the shock pad is dependent on whether play equipment is present. Artificial grass is porous and can be used all year round making it ideal for school playgrounds and public play areas. The grass can be used effectively as a cover for mounds and slopes. The area is then dried with a gas lance and cleared of leaves and debris. Edges are primed twice to reduce shockpad shrinkage. If a safety surface is required, the impact absorbing layer is first installed using SBR rubber. Materials are mixed with a resin-binder and transported by wheelbarrow to the area for laying. The mixture of rubber and resin is levelled to the required thickness, and a screed, roller or hand trowel is used to smooth and lightly compact the surface to gain an even, level finish. Once the SBR layer has cured, the artificial grass layer is rolled out and cut to size using a stanley knife. Binder is used to seal joints and prevent lift around edges. Once fixed in place, sand is spread onto the grass. This extra weight means that the grass stays in place. The sand provides stability and protects the turf. As a result, no wrinkles or folds develop through use. The sand also surrounds the long blades of artificial grass and ensures that they remain erect. Artificial Grass is a low maintenance product. However, it should undergo regular inspection and maintenance to keep it in optimum condition. It can take 6-8 weeks for your artificial lawn to reach its optimum condition. All artificial grass products require an evenly distributed infill and this ‘bedding in’ period allows the infill material to fully penetrate and settle into the structure of the turf. It is important to brush your lawn on a regular basis. Brushing should take place at least once every month depending on your usage and should be carried out using a stiff brush. Brushing should be undertaken in a number of directions to help remove debris and leaves. It is important that the turf pile is maintained vertically – this can be achieved by brushing against the pile direction to avoid pile flattening. From time to time, some infill may appear on the surface of your lawn. This only requires light brushing to return it into the turf structure. In adverse weather conditions the surface may be prone to frost and/or ice. The surface will not be affected by the application of granular sodium chloride. All debris should be removed from the surface by brushing or raking with a large plastic fan rake; or with the use of a leaf blower. It is important to prevent organic matter from building up in the turf structure. Letting it accumulate will affect drainage and also encourage weed growth. Moss and weed killing should take place once a year or as required, ensuring that there is no accumulating vegetation on the surface. The moss and weed killer agent must be a water-based product and have a maximum pH balance of 8. Please also ensure that when the moss and weeds have died off, all dead matter, including roots are removed or in the case of moss swept out of the turf structure. Pet stains should be removed straight away. This can be done using a solution of lukewarm water mixed with a gentle household detergent such as washing up liquid. Additionally, rinse the area down with a garden hose – this will help to remove any lingering odours created by pet waste. 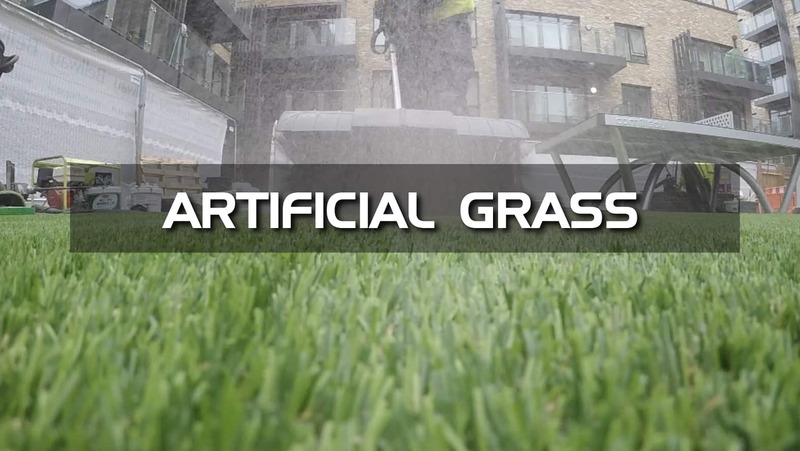 Q: Are there different types of artificial grass? A: Yes, there are different types of artificial grass. Some have short pile and are harder to touch but more durable. Others are longer pile, soft to touch and look more like authentic grass. Q: Do you have to put sand in the grass? A: Ideally yes. It helps to keep the pile standing up, acts as a weight and importantly reduces static build up. It also helps the grass to retain moisture in the summer, keeping it cool. Q: Is artificial grass suitable for pets and children? A: Yes, our artificial grass is engineered from the highest quality yarns, ensuring that they contain no toxic properties, such as lead, and making the products safe for children and pets. Any pet waste can be cleaned away easily using lukewarm water and a garden hose, leaving no long lasting effects on the grass. Q: Does artificial grass require any maintenance? A: Once the grass has been installed, it only requires a minimal level of maintenance. We suggest ‘light and often’, so a regular, light brushing will help stop the fibres from flattening and infill from settling. From time to time, you may also want to top up your infill to help rejuvenate the overall look of your grass. Q: Can weeds penetrate the surface? A: No, fibres in the artificial grass are tufted into a very strong backing cloth which helps to prevent roots from growing up through the grass. Weeds may occasionally appear on the surface as a result of windblown seeds. Small numbers of weeds can be removed by hand without damaging the surface. If the weeds are removed by hand, it is important to ensure that the full root of the weed is extracted, not broken off. Q: What is synthetic grass made from? A: Our synthetic grass is made from either polypropylene or polyethylene yarn depending on its end use. These materials are durable and U.V stabilised, sourced from TenCate Grass, the world’s leading yarn manufacturer. The yarn is tufted into a polypropylene backing cloth and rubber back for maximum turf retention. Q: Does water drain through the grass? A: Yes. In fact, our systems have specially designed drainage holes placed consistently throughout the turf to ensure water sheds quickly and efficiently and does not pool on the surface. Sub bases upon which our systems are installed are designed to provide superior drainage properties.